Happy Ganesha Chaturthi to all my readers !! Ganesha Chaturthi or Binayaka Chaturthi festival marks the birth of Lord Ganesha. It is that time of the year when one sees Maharashtra and other parts of India celebrating the festival of Ganesha Chaturthi with much fervor. After 10 days of fun filled devotion to the lovable Lord Ganesha, the celebrations come to an end by the immersion of Ganapati, known as Ganapati Visarjan. During these 10 days, people bring home idols of Lord Ganesha and worship with a variety of offerings or prasadam. It is said that Lord Ganesha's favorite sweet is the 'ukadiche modak' and the puja concludes by making an offering of 21 modaks to the deity. 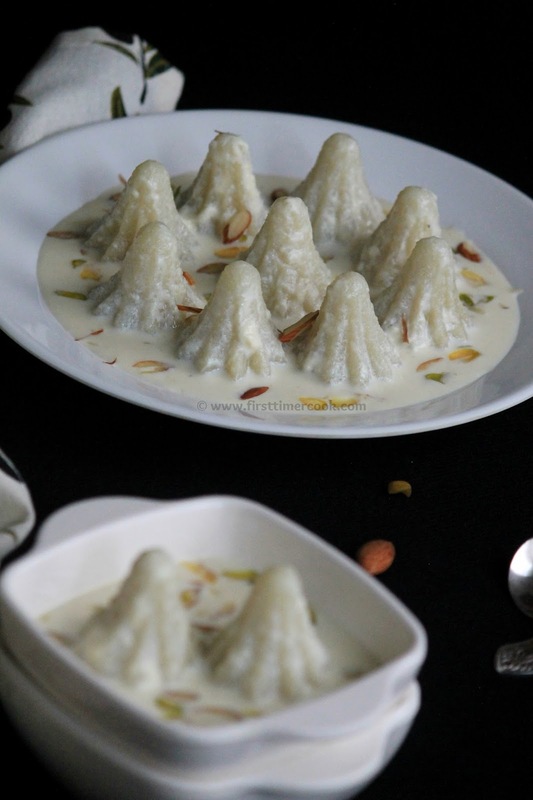 Ukadiche modaks are maharastrian modak where the modaks are made from ukad or rice flour dough. The sweet filling on the inside of a modak consists of freshly grated coconut and jaggery while the outer soft shell is made from rice flour. Modaks made with rice flour are preferred as offerings to the deity, however wheat flour version are used these days. Some innovative modaks have also been prepared now-a-days which include stuffed vermicelli modak, motichoor modak, chocolate modak etc. 25th August 2016, the day on which I have stepped into the blogging world. And voila, It is been 1 year completed today ! I cannot imagine that my second baby, my food blog www.firsttimercook.com is 1 year old now. And also today is Ganesha Chaturthi or Binayaka Chaturthi. So It's time for double celebration. On this auspicious day, I have prepared a dish which is none other than the Elephant God's favorite, modak but with a fusion. It is 'Modak Payasam' or 'Modak Kheer'. 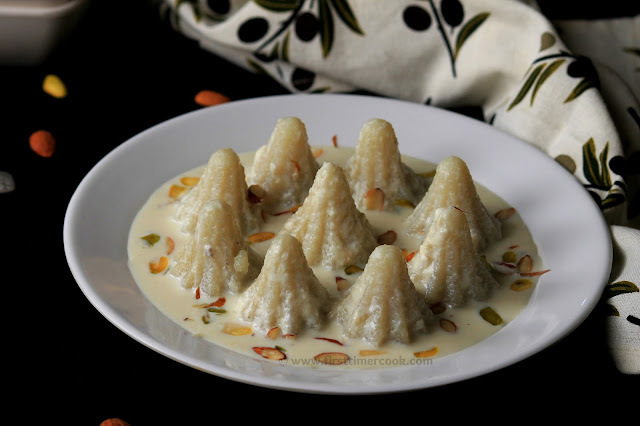 I just love the flavor of modak in creamy milky base. To know more details about this lip smacking offering or dessert, lets go in details as mentioned below. Apply ghee all over the modak mold and keep aside. Heat grated jaggery in a pan. Once it froths up, add grated coconut and mix well. Add cardamom powder and keep stirring until the mixture thickens. Turn off the heat and let these stuffing cool down completely. Meanwhile, bring water to boil along with ghee. Once the water boils, turn off the heat. Immediately add the rice flour and stir quickly. Make sure there are no lumps. Cover the dough and let it cool a bit. When it is still warm, smear ghee over your palm and knead the dough in a mixing bowl until a soft dough forms. Keep aside. In a heavy bottomed pan, boil milk on low heat till it reduces to 3/4th stirring in between. Meanwhile, pinch out a small portion of the dough and put it in the modak mold. Press along the edges of the mold, so that there will be a cavity or gap in the center. Fill it with 1 tsp of stuffing, finally seal by some more dough. Now delicately open the mold and remove the modak. Similarly prepare modaks from rest of the dough. Then in a steamer, steam all modaks for 5-6 minutes on medium-high flame. By the time, milk would be reduced to 3/4th. Add sugar and cardamom powder to the boiling milk and boil again till the sugar dissolves completely. Next add all the modaks to the boiling milk slowly and allow to cook for 8-10 minutes. 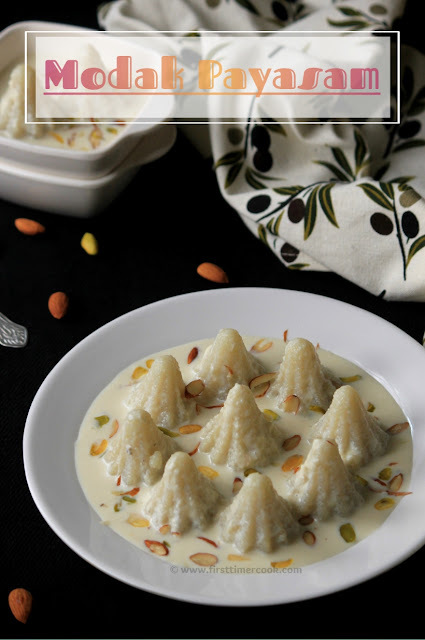 Turn off the heat, cool the modak payasam and serve chilled or warm ! 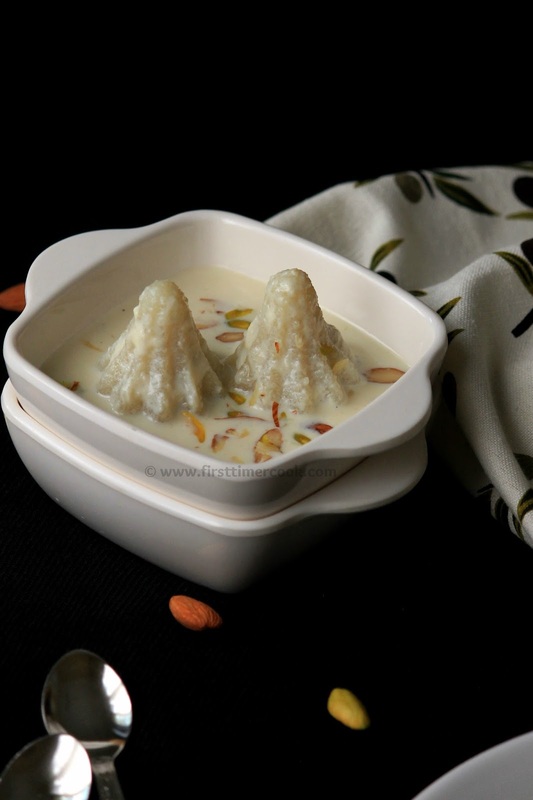 Prefer to use small modak mold, Otherwise more milk quantity will require in order to completely cook the modak. Shaping the modaks can be done in mold as well as by hand. To shape them by hand, first grease your palms with ghee. Pinch out a small portion of the dough and place on the palm of one hand, press gently as thin as possible to make a disc shape, place 1 tsp of stuffing at the center, then bring all the edges together and form a conical or round shape. Do not overfill the stuffing, otherwise modak may break while steaming as well as cooking in the milk. The rice dough should be handled while warm, else there will be crack while making modak. Here are few more recipes you can try as Choco Lava Modak , Motichoor Ladoo , Angoori Rasmalai ,Rawa Ladoo ,Kesar Pista Milk Peda , Churma with Methi Rooti , Mawa Gulabjamun. Aromatic and delicious! Beautiful thought and recipe!